Infant surrounded by protective malaria bed net in Ghana. The number of people killed by malaria has been cut by nearly half in Africa and a slightly lower rate globally, but sustained funding is needed to lower the numbers even more, according to the United Nations health agency which today released its annual assessment report on the disease. “This remarkable progress is no cause for complacency: absolute numbers of malaria cases and deaths are not going down as fast as they could,” said Margaret Chan, WHO Director-General. Global efforts to control and eliminate malaria reduced mortality by 45 per cent worldwide, and 49 per cent in Africa, according to the World Malaria report 2013 published by the UN agency. That is the equivalent of 3.3 million lives saved between 2000 and 2012, the large majority in the 10 countries with the highest malaria burden, and among the most affected age groups – children five years old and younger. Among such innovation, WHO announced that it is developing a global technical strategy for malaria control and elimination for the 2016-2025 period. It is also creating a global plan to control and eliminate Plasmodium vivax malaria which is prevalent in Asia and South America, and generally responds more slowly to control efforts than other strains of malaria. 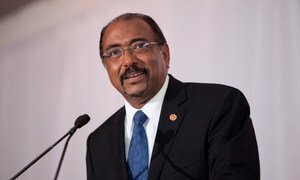 The Joint United Nations Programme on HIV/AIDS (UNAIDS) welcomed today a $12 billion commitment by international partners to the Global Fund to Fight AIDS, Tuberculosis and Malaria at its fourth replenishment meeting in Washington, DC.